Thirty years after its L.A. premiere, Lyle Kessler’s darkly humorous and unflinching drama Orphans is having its Broadway premiere with a top-notch cast led by Alec Baldwin, Ben Foster and Tom Sturridge. Read on to find out how this fearless piece of theater built its reputation and impressed audiences around the world. Set in a run-down house in North Philadelphia, Orphans is the tale of two orphaned brothers, Treat and Phillip. Treat is forced to assume the role of parent for the simple-minded and reclusive Phillip and, with no rules or parental guidance, gets into thieving and street hustling. Things change when Treat kidnaps Harold, a wealthy thug who takes charge of their lives. Orphans had its world premiere on August 31, 1983, at the Matrix Theater in Hollywood. 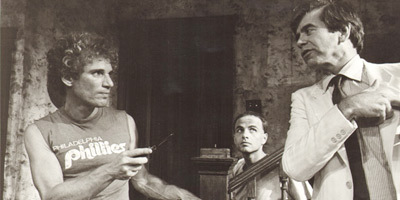 Starring Paul Lieber, Joe Pantoliano and Lane Smith, the John Lehne-helmed production was well-received by critics. “I find it a lovely, touching play,” Los Angeles Times critic wrote. “And it deals with heroic struggle, which I identify with. And it plays.” Originally, one major character didn’t die at the end, but Kessler rewrote the ending more than 25 times. In 1986, Orphans became the first Steppenwolf production to be performed internationally at London's Apollo Theatre, where Albert Finney played Harold. Finney won an Olivier Award for his performance and went on to reprise the role on the big screen. The film included seven additional characters and was opened up from the claustrophobic one-room set. Although the actors received good reviews, the film was not a box office hit and critics such as Roger Ebert wrote that Orphans was better suited to the stage. 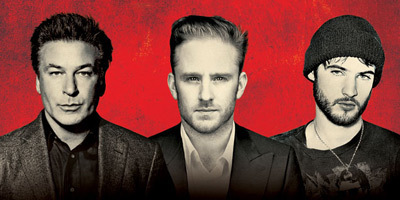 A play with three juicy parts is Broadway star bait, and Orphans is finally getting its Great White Way debut in a production starring Emmy winner and Tony nominee Alec Baldwin and Broadway newcomers Ben Foster (as Treat) and Tom Sturridge (as Phillip), directed by Daniel Sullivan. 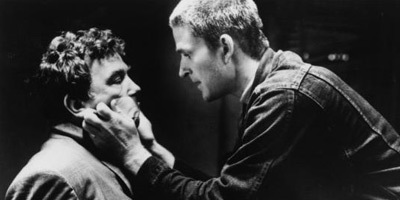 Baldwin saw a 2005 workshop version of the play featuring Al Pacino, Jesse Eisenberg and Shawn Hatosy and immediately knew he wanted to play Harold on Broadway. “I went to producers and said, ‘Let’s do it.’” Baldwin told the New York Times. “You spend years tracking plays until you’re right for them and then try to make the other factors happen. I like shows with a language that I never get tired of. I’ve always wanted to work with [Daniel] Sullivan.” The production made early headlines when Shia LaBeouf exited the role of Treat after drama in the rehearsal room, but the show went on with Foster after a short delay in the beginning of previews. Orphans opens at the Schoenfeld Theatre on April 18. 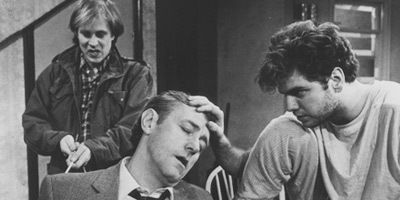 Alec Baldwin and Ben Foster star in Lyle Kessler's drama.